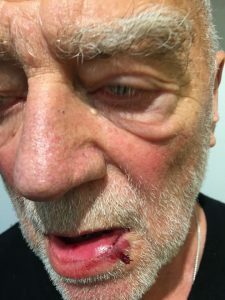 Achim Bergmann, after being punched. Via Facebook. Several incidences of far-right violence have been reported at this year’s Frankfurt Book Fair, which concluded at the end of last week, leading at least two people to seek medical treatment. The incidents were reported by Deutsche Welle, Germany’s public international news agency. Nico Wehnemann, attacked by “a Nazi.” Via Twitter. More violence erupted at the fair the next day, when Nico Wehnemann showed up to protest at a far-right stand, where he claims he was tackled by a neo-Nazi, beaten by private security forces as police watched without intervening, and then carried off while a crowd chanted, “Sieg Heil!” (It is illegal to be a Nazi in Germany.) Wehnemann is an activist with Die PARTEI, a satirical German organization whose name is an acronym for “Party for Labor, Rule of Law, Animal Protection, Promotion of Elites and Grassroot-Democratic Initiative” (“Partei für Arbeit, Rechtsstaat, Tierschutz, Elitenförderung und basisdemokratische Initiative). He intends to press charges.